In case you missed the update yesterday afternoon, the entire photo collection is now up on Flickr here (about 20 photos did not make the cut – I’m getting a new cell phone this week). I’m still organizing all my notes and handouts, so here is the first set of notes and observations from the floor. I only spent two days on the floor and could not cover every vendor in detail, so please feel free to add a comment to cover anything I missed. – FHH had less-than-lethal firearms on display, FN 303, 303P – they fire a 68-cal, fin-stabilized projectile that is an impact or CS round from a 15-rnd drum. – Winchester pushed their SXP Extreme Defender and Marine Defender, pump-action 12ga; claims to be fastest pump action (I wonder about short strokes), but the big feature seems to be the price – sub $500. – Loved handling the H&K .45 Tactical and Compact. – 458 Socom uppers from RRA – still backlogged for over six months. – Mykel Hawke (Man, Woman, Wild) showed off his survival knives and tools. – S&W dedicated a lot of floor space to Performance Center guns and had several on display, but not a 460V or the short-barrel 629 that I own. Reps were dismissive about any new guns that will be added to the PC line this year. A couple reps. talked about the San Antonio PD switch to M&P pistols. Lots of people looking at the M&P 10. 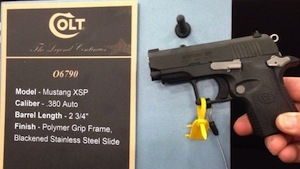 – Colt showed off the Mustang XSP (yes, Colt and polymer). One rep pushed the Marine 1911. – Biggest draw from the Glock booth was getting your picture taken with The Gunny – if you had not already seen the G30S, you could get your hands on one – pretty much everything in the lineup, but I did not see a G38. One Glock rep. mentioned that Glock will increase the number of guns manufactured in the US. The words ‘made in the USA’ will replace ‘Austria’ under the logo. – Kahr was promoting the re-introduced Thompson Custom 1911 and the CW 380. – Taurus – The Millennium G2 (adj. rear site, LCI, textured grip) seemed to be the hot item (and, of course the ‘Carry On’ campaign), but I was more interested in the revolvers … and the girls. – The next time I say to myself ‘I should get on of those Ted Nugent t-shirts’, I should listen and not put it off until later. – Magpul would not confirm where they are moving – I wanted them to say ‘Texas’, but no such luck. – Lots of holster vendors from FlashBang to Sticky Holster to Kangaroo Carry (FlashBang seemed to get the most press). Austin Davis from Kanagroo Carry will be making a big announcement in the near future, and it won’t involve holsters (can’t say anything more at this time). Probably the most innovative concept I saw was the Phalanx smart holster – a retention holster that does not allow the gun to be removed directly upward in any way. The gun is pushed down into the belt-mount system, simultaneously releasing the gun and chambering a round – requires learning a new draw, but interesting concept. – Zombie Industries probably got a close second in media coverage. The ten targets for five bucks package was too good to pass up. The bleeding targets cost $90. – No guns for sale, btw, on the floor. 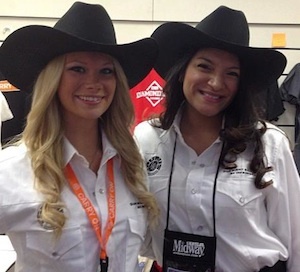 – Lots of vendors selling hunting excursions around the world. – At Chiappa, Rhinos were popular and they also had the three-barrel shotgun (Triple Crown) on display. 18.5″ or 28″ barrels w/Rem Choke. MSRP looks to be about $1600. Ouch – you could get a UTS-15 for that. 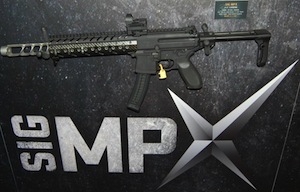 – The MPX was big at Sig Sauer (modular submachine gun, short-stroke gas piston, closed bolt). Pistol calibers (9mm, .40 S&W, .357 Sig), that can be field switched. A custom sleeve fits over the muzzle break to complete a suppressor. The P556 pistols with forearm grip were interesting. – The Hi-Point 9mm carbine was cool. – If your timing was right, you could get an autograph from the Barrett family and get your hands on one of the big 50’s. Barrett is actively developing rifles in new calibers, but other than taking customer input, they were very tight-lipped about direction. The MRAD was very popular. – Remington had lots of accessories for sale and the Model 783 seemed to get a lot of attention. 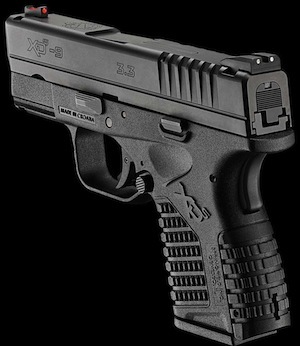 – Springfield – the XD-S 9mm is for real. Rumors are June, but Sprinfield would not say for sure. – Pyramid Air had an airgun range on the 3rd floor that was open for most of the day Th – Sun. I didn’t get a chance to check it out, though. – The Wall of Guns raffle attracted a lot of people on Saturday. – The NRA store was huge and had lots of cool stuff, but I was out of luck when it came to sizes of the one item I wanted to purchase. – Lots of vendors offering services for companies in the firearms business, like credit card processing. – The Red Jacket Firearms booth (and personnel) were very underwhelming. – In addition to R.L. 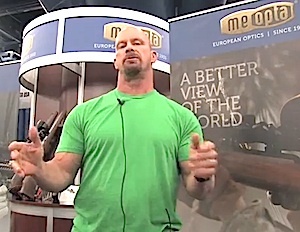 Ermey at Glock and the Wyatt Family at S&W, other big-name celebs included Steve Austin making an appearance at the Meopta booth (promoting his Broken Skull Ranch scope). I’ll try to finish this off tomorrow. Thanks a lot for dropping by.